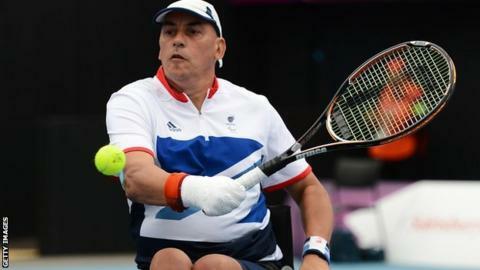 Great Britain's Peter Norfolk surrendered the Paralympic quad singles crown that he has held since 2004 as Israel's Shraga Weinberg hit back to win their quarter-final 3-6 7-5 6-0. Norfolk, 51, who carried the union jack at the opening ceremony, was the only remaining Briton in the draw. He tapes his racquet to his wrist but said he had grip problems. "Once it goes there isn't much to do," he said. "It was a combination of tape and a loss of strength when you swing." Norfolk had seemed in control as he swept up the first set with relative ease. But in sweltering conditions Weinberg wrestled the second set his way and tore through the decider in 33 minutes. Norfolk has one remaining chance of a home Games gold medal when he and Andrew Lapthorne take on American pairing David Wagner and Nicholas Taylor in Wednesday's doubles final. "We'll have a moratorium and be depressed tonight, but it is another match tomorrow," he added. Lapthorne and Jamie Burdekin were both knocked out in the first round of the singles competition.